(CNN) -- The world will be watching as Barack Obama is sworn in as president of the United States of America. In anticipation of the inauguration, reporter John Zarrella, photojournalists Dominic Swann and Greg Kilday and I traveled to some of the landmark sites of the civil rights movement to reflect on events that helped shape this historic moment. 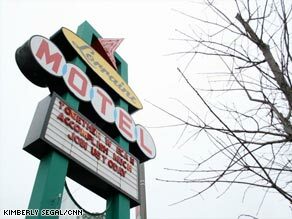 The National Civil Rights Museum is attached to the Lorraine Motel, where the Rev. Martin Luther King Jr. was assassinated. Here are some of the highlights of our Southern Civil Rights Tour -- aka Road to the White House trip. This itinerary is no way exhaustive, but it allows for an educational and easy driving tour, starting in Little Rock, Arkansas, and ending in Montgomery, Alabama. This historic school looks the same as it did in the famous black-and-white photos from 1957. Central High was the school where nine black students tested Brown v. Board of Education, the U.S. Supreme Court decision that paved the way for the end of segregation. Arkansas Gov. Orval Faubus rejected orders to desegregate the school and sent the Arkansas National Guard to prevent the black students from attending. In light of Faubus' statements on television, a white mob kept the students out of the all-white school until President Dwight Eisenhower federalized the National Guard troops and sent the 101st Airborne into Little Rock. The elite Army unit spent weeks escorting the nine students to class. At the visitor center across the street from the school, a permanent exhibit is dedicated to the crisis. There is no charge to enter, and the center is open daily from 9 a.m. to 4:30 p.m. The two-room exhibit includes several interesting films that explain the plight and the players. The high school remains in session, despite being within a national historic site. Advance arrangements are required for a tour of the school. Call 501-374-1957, or visit a Web site about the school's national historic site here. The museum will captivate visitors' interest for an entire day. The exhibits begin with slavery and end with recent international human rights movements in a space across the street in the building from which James Earl Ray shot King. The tour is a chronological walk through history with many interactive displays. In one exhibit, visitors board an old Montgomery, Alabama, bus in which the driver orders people who sit at the front to go to the back of the bus, the same way African-Americans would have been required to do during segregation. Just over an hour south of Memphis is Oxford, Mississippi, the home of the University of Mississippi, or Ole Miss, as it is affectionately called. In 1962, one brave black American, James Meredith, changed 114 years of tradition. When Meredith entered the all-white university, a mob was waiting for him. While federal marshals protected Meredith, the crowd threw rocks and bottles, and a melee ensued. The incident resulted in the deaths of two people and more than a hundred people injured. Walking among the diverse student body today, visitors have to look purposefully to see the past. The restored Lyceum building is where Meredith registered for classes. In front of the stately building is a circle where the protesting students gathered. Signs mark other significant areas on campus. Southwest of Oxford -- about a two-hour drive away -- is Money, Mississippi. It is easy to drive right past the grocery store at the center of the 1955 Emmett Till tragedy. Bryant's Grocery changed its name to Young's, and the dilapidated building is still standing, barely. This is the store where a 14-year-old black boy's encounter with the white female proprietor cost him his life. Witnesses say Till whistled at Carolyn Bryant in the store. Bryant's husband and his half-brother brutally attacked and killed Till. There's not much else in Money, but you may find it worth a quick stop before time turns this landmark into an empty lot. Continuing south, the next stop is Jackson, Mississippi, about two hours from Money. The house of Medgar Evers, the NAACP's first field officer, is here. Evers and his wife, Myrlie, established NAACP chapters throughout Mississippi. At 2332 Margaret Walker Alexander Drive, this unassuming house is in the middle of an active neighborhood. The house is the only one on the block without a front door, as the Everses thought it was safer to enter through the carport. Unfortunately, this precaution didn't deter Evers' assassin. Medgar Evers was killed in his carport June 12, 1963. The interior of the home provides a good idea of how this family lived in fear. The children's mattresses are on the floor to avoid bullets shot into the home through a window. To access the home, visitors must contact Minnie Watson (mwatson@tougaloo.edu or 601-977-7839). Watson will gladly open the house and answer questions about Evers, who she said "did more for the state of Mississippi than any other civil rights advocate." There is no cost, but donations are appreciated. It's a three-hour drive east to Selma, Alabama, where Bloody Sunday and the Selma-to-Montgomery 1965 voters rights march took place. What better location to visit on our Road to the White House trip than the National Voting Rights Museum and Institute, which is at the foot of the Edmund Pettus Bridge at 1012 Water Ave. The museum is a tribute to the foot soldiers who took part in these monumental events. In the museum, the "I Was There Wall" is a place where march participants can leave messages, and there is a map highlighting Selma's historic district. The map includes locations such as the Dallas County Courthouse, where many African-Americans unsuccessfully tried to register to vote. Entrance to the museum is $6 for adults and $4 for children and seniors. It is closed on Sundays. Read more about the National Voting Rights Museum and Institute. Go over the bridge on Highway 80 for the final 50-mile stretch of road into Montgomery. This route is now a National Historic Trail, and the Lowndes County Interpretive Center is along this road between Selma and Montgomery. Click here for more information on the trail and other historic sites operated by the National Park Service. To make the most of this trip back in time, you may want to purchase a civil rights travel book such as "Weary Feet, Rested Souls" by Townsend Davis. And don't forget to ask the locals where to eat; you will find some great barbeque and Southern home cooking on your travels.